In a conference call with fashion icon John Varvatos who is one of three mentors on the new NBC fashion competition show “Fashion Star” Varvatos spoke with press to answer questions about his work on the show and the fashion industry in general. Varvatos was joined by Executive Producer Ben Silverman on the call. This week’s episode is “The high/low” episode stated Varvatos, one viewers will not want to miss. The most important thing for a designer on the show stated Varvatos is learning how to sell to a vendor such as Saks Fifth Avenue and another vendor like H&M. Both retails have extreme price differences – high and low. The best advice Varvatos has for these designers on the show is to listen to the mentors navigating them through the waters to get products bought. He also said, in order to survive to the end of the show, they can’t just be bought by one store all of the time. 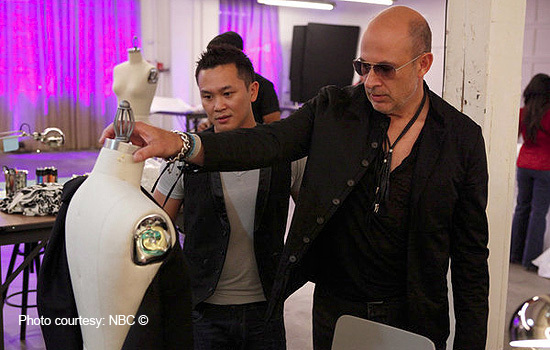 Varvatos at work on "Fashion Star" mentoring a designer. During the process of the show, when asked how have buyers surprised him, Varvatos stated, “They know their business and their customer. If you dial into their store and customer and not their personalities” that is the key for the designers. The designers on “Fashion Star” do not know their design challenge until two days before the show, said Varvatos. “These people (designers) need to think on their feet and know who the customer is. The biggest problem is that they didn’t think about ‘where do I want to be in the store”. Varvatos stated because the modern technology has influenced the immediacy in fashion so drastically over the years since when he started out with Polo Ralph Lauren in 1983, it has changed how people shop. “Paris, Milan were leaders. Now it’s an even playing field. Inspiration and trend are of the moment”. When asked if Varvatos and the other Mentors that join him, Nicole Richie and Jessica Simpson provide any support to the designers after the show, he said “The experience they’re getting is great. They’re building a brand. In the end from wholesale is the world going to see it?” His role is to help guide them through the process. They’re reaching a broad consumer base and they have to know how to sell to H&M and Macy’s…sales at different price points. HOLLYWOOD JUNKET asked Varvatos if any of the designers’ personal style or signature was sacrificed in order to please the stores and the broader audience. He responded, “No. They knew what they were walking into. They know how to create their own personality” and that none of the designers expressed that to him during the show. The winner of “Fashion Star” will receive $6,000,000 in orders for capsule collection in all three of the retailers involved in the show- H&M, Macy’s and Sacks Fifth Avenue. “Fashion Star” airs Tuesdays 10/9 c on NBC.